Where Can I Find Suppliers of Shrink Wrap Sheeting? In ‘How Do I Choose a Scaffold Shrink Wrap Installation Company?’ we looked at how scaffolders and contractors can go about choosing a sub contractor / specialist installer who will be both supplying and fitting the shrink wrap for you. We finished by taking a quick look at some other companies in the UK (in addition to ourselves) who provide a scaffold shrink wrap installation service. However, if you want to carry out the installation of the scaffold shrink wrap sheeting yourself, using your own in house labour, then you are going to need to find a reliable supplier for rolls of scaffold shrink wrap material. 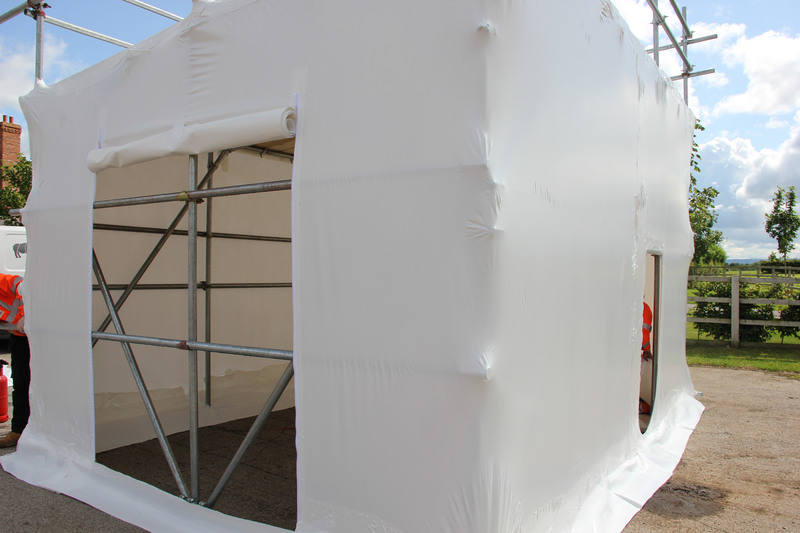 Buying a good quality scaffold sheeting from a good supplier gives you the best chance of creating encapsulation and containment jobs that work as intended and which you can be proud of. Of course we will be delighted if you choose Rhino as your supplier when you need to buy rolls of shrink wrap sheeting. However, rather than just tell you that we are the best, and expect you to just ‘take our word’ for it, this article takes an unbiased review of the suppliers of scaffold shrink wrap in the UK, and suggests some criteria which might help you decide which one will be the best ‘fit’ for you. You may come across information on the websites of a shrink wrap suppliers that suggests they are the actual manufacturer of the rolls of shrink wrap. The inference seems to be that buying shrink wrap ‘direct from the manufacturer’ benefits the scaffolder or contractor through lower prices by cutting out the middleman. Perhaps companies also claim to be the manufacturers of shrink wrap sheeting for scaffolding to make their company appear bigger than they really are. Whatever the reason, the truth is that every scaffold wrap supply company you will find by doing a search on the world wide web are not really manufacturers but distributors and wholesalers. This includes us at Rhino Shrink Wrap. There is not one supplier of scaffold shrink wrap in the world who manufacture their own shrink wrap film. There are two reasons for this; 1. The plant and machinery required to extrude industrial sizes of shrink wrap film is very large, very complex and hugely expensive. 2. The companies that own and run shrink wrap extruders must run them almost continuously and supply a huge variety of industrial and agricultural markets to make it economical. Although the use of shrink wrap for scaffolding encapsulation and containment has grown from almost nothing 10 years ago to a world wide activity today, it is still a specialised activity that even taking the entire worldwide demand for shrink wrap scaffold sheeting would probably not keep one shrink wrap extruder operating at full capacity. The reason I mention this is that at Rhino Shrink Wrap we are dedicated to complete transparency with our customers and we feel that claiming to be the manufacturer is deliberately misleading to scaffolders and contractors. How do I choose between suppliers? When faced with choosing between the products of a list of suppliers it is quite normal to immediately look at the price. Which of the suppliers openly discusses pricing and explains what affects the pricing of their products? In this respect, only Wrap It from the list above openly display their pricing which is helpful when time is at a premium and you just need to find pricing information. Although a ‘fully installed’ price can be affected by many variables, the pricing of materials and equipment should be static and easy to research. Once again, in aid for maximum transparency it is something we always try to be open about at Rhino. You can find our current price list here. I think most of us know that the lowest price scaffold sheeting may not always be the lowest ‘cost’ scaffold sheeting. If the low price is at the cost of quality so that the sheeting will not stay fixed then the time and cost of repairing and replacing damaged sheeting can often far exceed any savings in the first place. As a minimum you should be looking for a 300 micron thickness film for scaffold shrink wrapping that is flame retardant. We would recommend a roll size that is at least 7m wide but since sheets of shrink wrap are easily joined, other sizing may not be a problem, depending on the size of the scaffold you are covering. What certification is available for the sheeting you are buying? Typically you should expect to see quality certification from the manufacturer (not from the distributor). The reason you want to see the manufacturers certificate is that one of the major complaints of anyone who buys rolls of shrink wrap is inconsistency between rolls. Quality certification suggests (along with computer controlled production facilities) that they have the processes in place to make sure that every roll is the same as the last. For flame retardant films you should review the flame retardant certification. As a minimum the film should be flame retardant to EN13501. However, some high risk sites may expect that the shrink wrap sheeting has been certified to the LPS1207 and LPS1215 standard. Do they carry decent stock levels? With widespread pallet distribution networks across the UK, next day delivery to the UK mainland should be possible even for large products such as rolls of shrink wrap. How much ‘real world’ knowledge does the supplier have of the installation process? I have to admit one of the things that drives us crazy at Rhino is scaffolders and contractors being ‘sold’ to by people in offices who have never set foot on a scaffolding or construction site. Suppliers who have their own installation teams have an advantage in that they are using their own products day in and day out. They will also understand the importance of working to the tight timescales that we often work to in the construction industry. An additional benefit of working with a shrink wrap roll supplier who is experienced in the application of the product is that they should be able to provide you with training or other support if you need it. Rhino Shrink Wrap supply shrink wrap materials and equipment and provide a fully installation service throughout the UK. Above all we provide the most extensive education resources, which we welcome you to use, whether you decide to buy from us or not.